First, his preview on Gale crater: "Gale Crater Geomorphology Paper – Published!" I attended the first half of yesterday, and will hopefully get my notes from that posted later today—after about a billion other things that I need to post first! This canyon occurs on the lower west side of the 5 km-thick mound in northern Gale Crater. It and several smaller canyons and troughs on the lower portions of the mound are evidence that the rocks MSL would study in Gale -- at least during the first one or two Mars years it is on the ground -- are so old that the layered material was deposited, buried, hardened to form rock, then re-exposed to the surface and eroded by running water (or similar liquid). The central part of the Gale mound contains layers of rock that were formed after this and the other canyons were created -- in other words, there a lot of changing environments and conditions are recorded in the Gale mound. 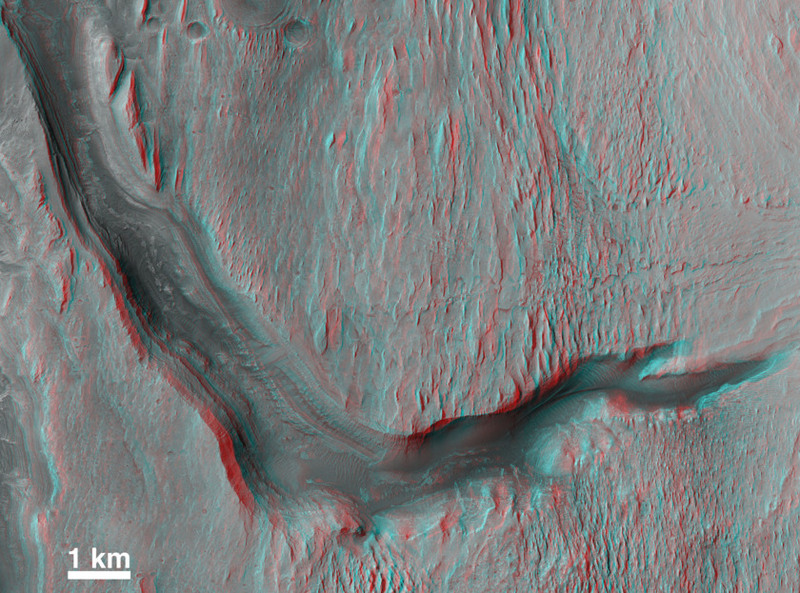 This picture is a stereo anaglyph (red left eye, blue right eye) composed of sub-frames of MRO CTX images P01_001488_1751_XI_04S222W and P02_001752_1753_XI_04S222W. North is up. The data were acquired in November and December 2006 and processed to make the anaglyph by Malin Space Science Systems personnel.